Creditor-imposed austerity led to increased rural poverty and food insecurity in Greece and violated people's right to food, the Transnational Institute (TNI), an international research and advocacy body based in Amsterdam, has concluded, 10 years after the country signed its first bailout deal. In the report, TNI found that an estimated 38.9 percent of rural citizens in Greece in 2017 were at risk of poverty, rural unemployment soared from 7 percent in 2008 to 25 percent in 2013 while rural income per capita dropped by 23.5 percent during the crisis years (2008-2013). 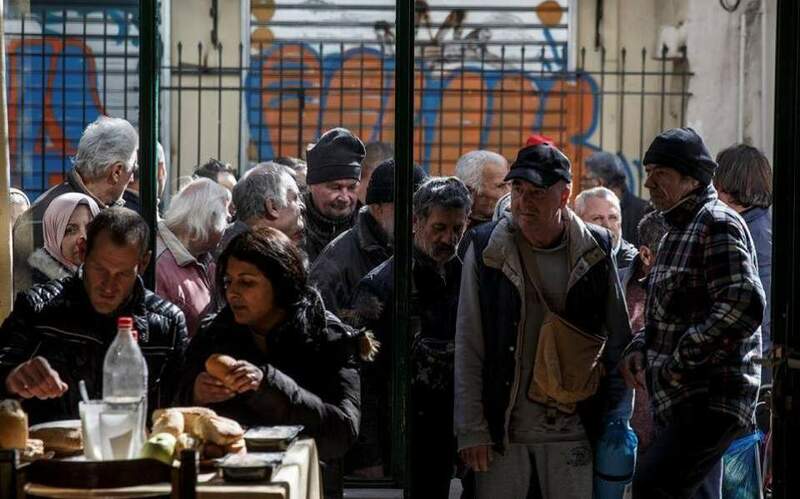 “Food insecurity across Greece has also increased – with food prices increasing at faster rates than prices in the eurozone during the crisis, despite the sharp fall in domestic incomes and labor costs. This led to a drop in food expenditure in total terms but an increase in food expenditure as a share of total monthly expenditure from 16.4 percent in 2008 to 20.7 percent in 2016,” notes the report. Based on fieldwork and interviews with over 100 key actors in 26 locations throughout Greece, as well as macro-economic statistical analysis and literature reviews, the report also found that the proportion of households that could not afford a meal with meat, chicken, fish (or vegetarian equivalent) every second day doubled from around 7 percent in 2008 to more than 14 percent in 2016. The share of households with children unable to afford a protein-based meal on a daily basis also doubled from 4.7 percent in 2009 to 8.9 percent in 2014, the report says. Commenting on the report on Tuesday, Olivier de Schutter, former special rapporteur on the Right to Food (2008-2014) at the United Nations and a member of the UN Committee on Economic, Social and Cultural Rights, said that the European Union could be held liable for violating Greeks' right to food. “I know some people are thinking about this and I’ve been asked to provide advice on this possibility,” he said. “Greece, we are told, is now out of danger, but the impacts have been enormous on the living standards of Greek families and on the right to food in particular. And it is essential that we draw the lessons from what has happened. These findings are a significant contribution to a debate that must now take place,” de Schutter added.